Food in Western France: a brief gastronomical tour! Normandy; Brittany; the Loire Valley. Rouen; Caen; Bayeux; Cherbourg; Mont-St-Michel; St Malo; Rennes; Nantes; Angers; Tours; Saumur; Vouvray; Amboise; Le Mans; Chartres; Orleans. Food in Western France will get you eating and drinking with a vengeance! 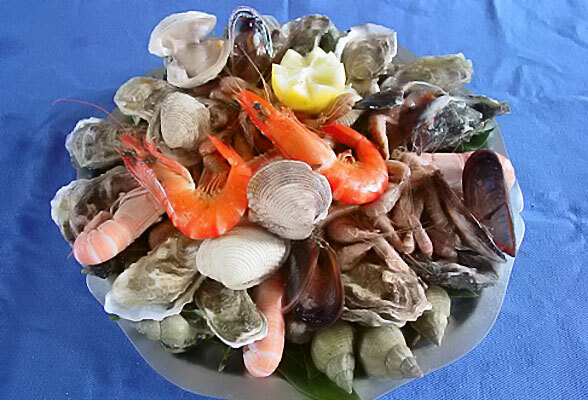 With such a long coastline, it’s to be expected that seafood and shellfish are popular in Normandy and Brittany (try the Belon oysters). "Fruits de Mer" simply means a selection of the local seafood, such as oysters, mussels, clams, crabs, shrimps, lobster, even cockles and whelks, all served cold (sometimes on a bed of ice), with fresh rye bread and ideally, washed down with a bottle of chilled Muscadet (one of my favourite wines, actually, especially “sur lie“). The one on the right is by Tom Dowson at Basse Copette, his luxury “Gite” (B & B) in Normandy near Aumale. Other specialities include salt meadow lamb and poultry, and artichokes are particularly valued. Vegetables blended with pork in a hot pot is Calfedpotfe. Rilettes are pieces of pork or goose meat cooked slowly in lard then shredded and potted; perhaps an acquired taste, like tripe, another northern delicacy. Crepes Suzette originally come from Brittany, but the region is also famous for buckwheat "galettes" stuffed with savoury mushrooms, cheese or eggs, as well as a truly amazing variety of crepes filled with sweets like chocolate or fruit (and don’t mention the cream). 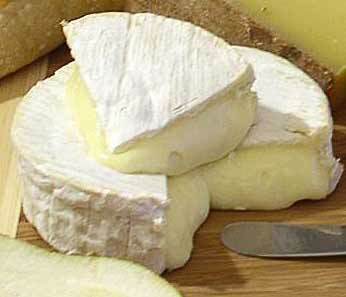 This is dairy country, and some of the best known cheeses come from here; Camembert, Pont l’Eveque, Livarot to name but a few, and the Loire is well-known for its goat’s cheese. In the Loire Valley there’s plenty of fish from the river (although not so much now that it is dangerously low) and fried eel is a traditional dish in Nantes. Many fish dishes come in "beurre blanc", a sauce made of white wine, shallots and butter. As far as drinks are concerned, still and sparkling cider is the local tipple in Normandy and Brittany, with Calvados (apple brandy) for something stronger. Dry white wines such as Muscadet, Vouvray, Pouilly-fume, Sancerre are favoured choices in the Loire. Want something stronger? The orange liqueur, Cointreau, is distilled in Angers. Food in Western France is a fine introduction to eating and drinking the French way, a good start to your gastronomical tour!